Wow! One of my art images is really getting some attention. 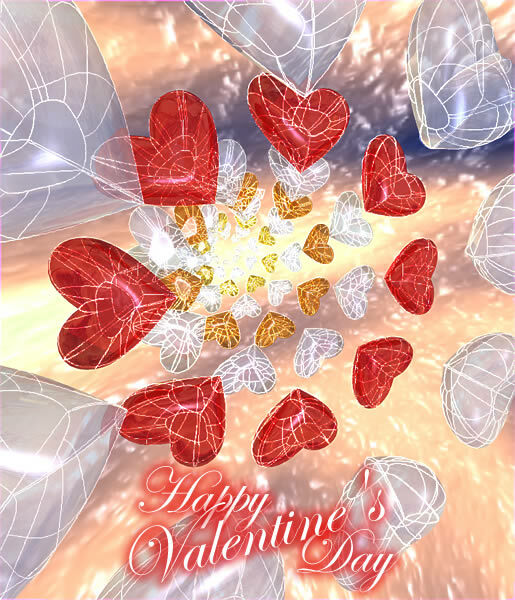 The last week or so, a growing percentage of inbound traffic on my site has been directed specifically at my 3D computer image, "Valentine Hearts". Hmmm... I wonder why? Could it be that Valentine's Day is just over a week away? As much as 30 to 40 percent of referral URLs indicate people visit my site by way of a Google Image Search for "valentine hearts". I checked out the results myself, and my artwork shows up on page 6 or so. I'm curious what people are using the image for. They must be using it to make a card or greeting for their loved one. I find it satisfying that one of my images is helping hundreds of people in this important display of love and/or appreciation (whether or not I approve of holidays purposed primarily for making retail dollars). In honor of this event (increased traffic), I'm posting this version of the image, with the standard holiday greeting. Hopefully even more people will find this and put it to "good use".